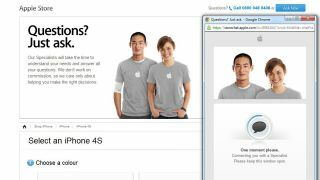 Apple has rolled out a new online training service for newbie iPad and iPhone owners on its website. The free one-to-one sessions with Apple specialists mean you no longer have to head for physical bricks-and-mortar Apple stores for comprehensive setup help. According to Apple, online store customers can already chat with specialists, request a call and experience a guided tour of the store. But the new feature means customers can now set up a one-to-one session online, to get specialist help configuring email, syncing with iCloud and other fiddly little tasks that come with a shiny new toy. In short it's an idiot-proof setup session that should remove all the stress from firing up that store-fresh iPhone or iPad. With any luck, the free-to-use service should remove any doubts Apple newbies have regarding personal data when upgrading their handsets or tablets. To qualify for an online setup session with a specialist, a customer must have purchased an iPad or iPhone through an Apple Product Specialist by clicking the "Ask Now" button on the iPhone or iPad pages. The only remaining question, therefore is what separates online "specialists" from in-store geniuses and whether your fruity new online friends themselves get the same freaky training that geniuses apparently receive. Is there something we should be told?